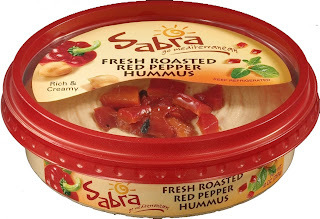 Have any of you tried any of the sabra hummus available on the market now? I am totally addicted! I can't get enough of this stuff. My favourite is the roasted red pepper hummus, but I've also tried the spicy hummus and it is good too. I know it seems crazy to buy hummus when it is so easy to make, but this stuff is worth the extra pennies. We love it with the fresh artisan breads and baby carrots. We get it at Sobeys in case you are wondering where to find it. I honestly think I could live on this stuff. I always have at least two containers in my fridge now. So if you wonder what I have been cooking lately, the answer is not much. On those days when it is just too hot to do anything in the kitchen I am sitting on my back deck with a container of sabra hummus and artisan bread and I'm done. This is my absolute favorite hummus and they actually sell it at Costco. It is soooo good! That or the La Fontaine hummus is really good too. Mmmmm, we eat the uber spicy variety of this hummus like it's goin out of style. It's so creamy and perfect. Even when I have my own yummy homemade at home I can rarely resist buying this from the store. Hi! I just found your blog from a search for Sabra Hummus. I'm a Canadian living in the Netherlands and I'm trying to lose weight. The Sabra Hummus has become a pretty big part of my diet and I really love it. I'm going back to Canada for 3 weeks in October and will be in Sydney, Nova Scotia. You said you found it at Sobeys? Is it available in other stores like Super Valu, do you know?